But, here it is… The winter of my life and it catches me by surprise. How did I get here so fast? Where did the years go and where did my youth go? I remember well seeing older people through the years and thinking that those older people were years away from me and that winter was so far off that I could not fathom it or imagine fully what it would be like. But, here it is… My friends are retired and getting grey. They move slower and I see an older person now. Some are in better and some worse shape than me. But, I see the great change. Not like the ones that I remember who were young and vibrant. But, like me, their age is beginning to show and we are now those older folks that we used to see and never thought we’d be. Each day now, I find that just getting a shower is a real target for the day! And taking a nap is not a treat anymore… it’s mandatory! Cause if I don’t on my own free will… I just fall asleep where I sit! And so… Now I enter into this new season of my life unprepared for all the aches and pains and the loss of strength and ability to go and do things that I wish I had done but never did!! But, at least I know, that though the winter has come, and I’m not sure how long it will last. This I know, that when it’s over on this earth… Its over. A new adventure will begin! Yes, I have regrets. There are things I wish I hadn’t done. Things I should have done, but indeed, there are many things I’m happy to have done. It’s all in a lifetime. So, if you’re not in your winter yet. Let me remind you, that it will be here faster than you think. So, whatever you would like to accomplish in your life please do it quickly! Don’t put things off too long!! Life goes by quickly. So, do what you can today, as you can never be sure whether this is your winter or not! 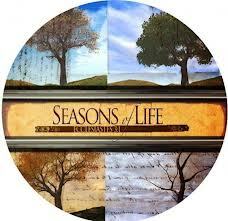 You have no promise that you will see all the seasons of your life. So, live for today and say all the things that you want your loved ones to remember. And hope that they appreciate and love you for all the things that you have done for them in all the years past!! “Life” is a gift to you. The way you live it is your gift to those who come after. Make it a fantastic one. Remember: “It is health that is real wealth – and not pieces of gold and silver. LASTLY, CONSIDER THE FOLLOWING: TODAY IS THE OLDEST YOU’VE EVER BEEN, YET THE YOUNGEST YOU’LL EVER BE SO – ENJOY THIS DAY WHILE IT LASTS. ~Your kids are becoming you…… But your grandchildren are perfect! Stay well, “OLD FRIEND!” Send this blog to other “Old Friends!” and let them laugh in AGREEMENT!!! This entry was posted in Just Good Stuff and tagged Appreciation, Getting Old, life, old friends, old paths, Philosophy, Retirement, seasons, situations. Bookmark the permalink.